Which Medals Would He Have Got? Carrying on from last week, this week's article is about what medals someone would have been awarded in World War 1. During World War One, there were 6 British campaign medals. However, you could not be awarded all 6, most commonly you would be awarded 2 or 3. You can see what your relative was awarded by looking at his Medal Roll Index Card. This does not include medals for gallantry. Also, you can try the Medal Rolls. The first medal is the 1914 Star. 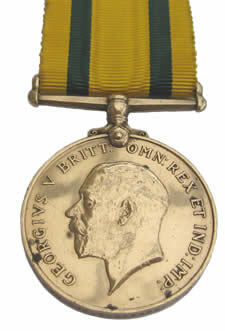 This was awarded to people who served between the 5 August 1914 and the 22 November 1914. If you got this medal, you would also be awarded the British War Medal and the Victory Medal. A collection of all 3 medals is sometimes called Pip, Squeak and Wilfred. Additionally, a bar was awarded to people who "actually served under fire of the enemy". Only 378,000 were awarded. A picture is shown at the bottom of the page. The next medal a relative could be awarded is the 1914-15 Star. 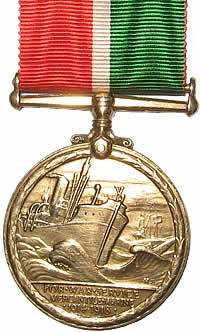 This was awarded to people who served between the 5 August 1914 and the 31 December 1915 who had not been awarded the 1914 Star. As like the 1914 Star, you would also be awarded the British War Medal and the Victory Medal and the collection is sometimes called Pip, Squeak and Wilfred. However, more people were awarded this star as 2,366,000 were issued. It looks very similar to the 1914 star. A picture is shown at the bottom of the page. The next medal, is the British War Medal. It was awarded to people who served between the 5 August 1914 to 1920. It was not just soldiers in the forces but was also awarded to staff of officially recognised non-military hospitals or cooks on Navy ships. To be awarded this medal you had to have served for at least 28 days. The collection of just this medal and the Victory Medal is sometimes called Mutt and Jeff. About 6,500,000 were awarded, 110,000 were bronze and the rest were silver. A picture is shown below at the bottom of the page. Next, is the Victory Medal. It was awarded to people who were mobalised between 5 August 1915 and 11 November 1918. Women could also be awarded the medal for work in the auxiliary forces. Each allied country would have its own Victory Medal. A total of 6,334,522 British Victory Medal's were awarded. Men recorded in dispatches had an oak leaf emblem on the ribbon. A picture is shown at the bottom of the page. The next medal is the Territorial Force War Medal. It was awarded to members of the British Territorial Force, who had been serving with the force on 30 September 1914 or had completed 4 years service with the force and rejoined before or on the 30 September 1914. Also they had to have a written or verbal agreement to serve the force on or before the 30 September 1914, had served between 5 August 1914 and 11 November 1918 and did not qualify for the 1914 or 1914-15 star. 33,944 were awarded. A picture is shown at the bottom of the page. The final medal is the Mercantile Marine War Medal. It was awarded to members of the Merchant Navy who served in a war or danger zone during the war. It is the rarest medal out of the 6 and only 133,135 were awarded. A picture is shown at the bottom of the page. Click on the medal to see the full medal.